The Winter 2012/13 issue of the Cuba Solidarity Campaign's 'Trade Unions for Cuba' eNewsletter is now available to view online. The eNewsletter contains all the latest news on Cuba and CSC with particular emphasis on our work with trade unions. Please forward the eNewsletter to friends and colleagues, share on social networking sites or print off for notice boards and distribution around offices. 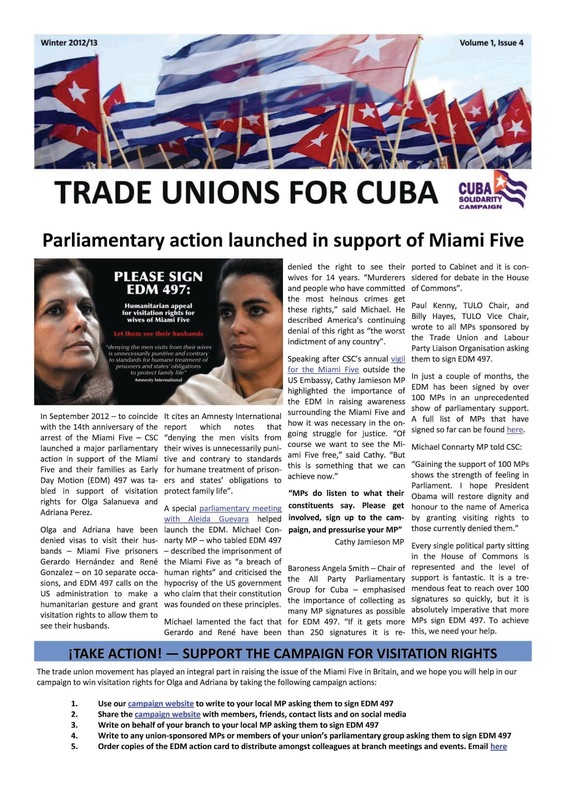 You can read 'Trade Unions for Cuba' online here. If you would like to receive the newsletter via email, please email us and we will add you to our mailing list. Drive anywhere in the Cuban countryside and you will spot the marabu lining the road: a dense, woody weed that grows as tall as trees and has invaded vast swathes of agricultural land. The land-grab began in the 1990s when Cuba was in economic crisis following the collapse of its great benefactor, the Soviet Union. The mighty sugar industry slumped too, and cane fields were overrun by marabu. But to one British firm, the aggressive weed is less a problem than a valuable resource. Havana Energy has just signed a $50m (£31m) investment deal to build a renewable-energy power plant in central Cuba, supplying one of the country's biggest sugar mills as well as the national grid. During the harvest it will be fuelled by sugar-cane residue, known as bagasse. The rest of the year it will be fed with marabu. "Marabu has a very high calorific level and low moisture, so as biomass it's very attractive," explains the firm's CEO, Andrew Macdonald. Harvesting marabu will also address a pressing issue on the island. "Seventy per cent of the food Cubans consume is imported, which is a national tragedy with their climate and soil," says technical director Keith Dawson. "Every Cuban hates marabu so we're doing a service: not just removing it but also returning the land to farming." The deal is a joint-venture with Cuba's state sugar monopoly and is part of a move by the Communist government to diversify its energy supply away from dependence on subsidised, imported oil from its socialist ally, Venezuela. "Cuba relies on diesel-powered power stations, which are even less green than coal, very expensive and give-off horrible emissions," Mr Macdonald explains, saying his firm's green energy will also be cheaper. Now the papers have finally been signed, the British team face their first major test. Early next year they will import a combination of forestry and construction equipment that they hope can harvest the marabu economically. No-one has managed that yet. "You can't underestimate marabu. We've brought foresters to look at it and they've been confused, and agricultural kit is not strong enough," says agricultural adviser Julian Bell. The plant's woody roots vary in size and are as dense as teak with fierce thorns. "Usually you just wouldn't bother. But I don't know anywhere else with 1.5 million hectares covered in such a good energy source," he says. There is another incentive. Research at Strathclyde University has revealed that marabu produces high-grade activated carbon for use in filters - like in Cuban rum production. Potentially, the carbon could also be used in new-generation fast-charging batteries. So Havana Energy will bring a reactor to the Ciro Redondo mill next year to trial carbon manufacturing. In the small town that grew up around the sugar mill, there is a good deal of expectation about the investment. The joint venture should create around 60 new jobs and includes funds to upgrade the dilapidated mill itself, now a century old. Only one of its three crushing machines are operational, it still has Soviet-era signs and ageing east German equipment, and large sections of the roof are missing. "It's in a terrible state," says retired sugar-worker Oberto Vazquez as he passes on his bicycle. "When it rains, it rains more inside than out." So for Cuba this venture is not only about sourcing alternative energy. The government is in the midst of a drive to boost sugar production, cashing in on higher global prices and increased demand from countries like China. It has reopened almost a dozen old mills, targeting 20% production growth per year. It has allowed foreign funds into the sector for the first time since the 1959 revolution. 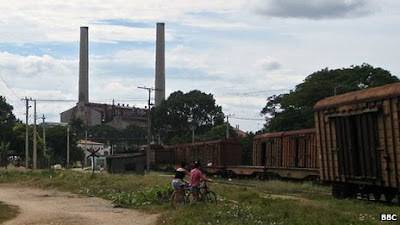 As well as the British venture, a Brazilian firm has been contracted to manage another large mill in a nearby province. "The main [British] investment is to build the power plant, but we have negotiated access to credit to improve the cane fields and the sugar mill itself," says Rafael Rivacoba, director of international relations at Azcuba, Cuba's sugar firm. "I think that's positive." He describes further foreign investment in the sector as a possibility, but is cautious. The deal with Havana Energy took three years to negotiate. "We're thinking about other things," he says, admitting that international sugar brokers are knocking at his door. "But nothing's been decided." On the ground in Ciro Redondo though, funding from anywhere is welcome. The mill can only afford to irrigate 12% of its crops today; average yields in the cane fields are under half the international norm. "We have the will and the knowledge," says manager Victor Dieguez. "But we need investment." That is now on its way and if this pilot project succeeds, the British team has an option to build four more power plants at other sugar mills. First though, it has to tackle the marabu: to prove that it does have the solution, to turn a weed into a valuable asset. How Cuba survived economic meltdown and became a world model of sustainability - organic farming, community gardens for growing food locally, use of renewable energy. 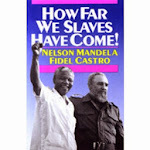 Buy it on DVD from the Cuba Solidarity Campaign Shop. Examination of Cuban agricultural experience since the Special Period. As Cuba seeks to avoid dependency on imported food goods and promote urban agriculture, can it provide a model for a post-petroleum food system? 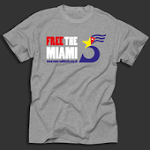 Buy it from the Cuba Solidarity Campaign Shop. Why is Cuba’s health-care system the best model for poor countries? Cuba-trained medical student examines Peruvian child, Lima, Peru, December 2010. Photo by Don Fitz. Furious though it may be, the current debate over health care in the US is largely irrelevant to charting a path for the poor countries of Africa, Latin America, Asia and the Pacific Islands. That is because the US squanders perhaps 10 to 20 times what is needed for a good, affordable medical system. The waste is far more than the 30% overhead by private insurance companies. It includes an enormous amount of over-treatment, making the poor sicker by refusing them treatment, exorbitant over-pricing of medications and medical procedures, creation of illnesses, exposure to contagion through over-hospitalisation, and disease-focused instead of prevention-focused research. Poor countries simply cannot afford such a health system. Well over 100 countries are looking to the example of Cuba, which has the same 78-year life expectancy of the US while spending 4% per person annually of what the US does. The most revolutionary idea of the Cuban system is doctors living in the neighbourhoods they serve. A doctor-nurse team is part of the community and know their patients well because they live at (or near) the consultorio (doctors’ office) where they work. Consultorios are backed up by policlínicos which provide services during off-hours and offer a wide variety of specialists. Policlínicos coordinate community health delivery and link nationally designed health initiatives with their local implementation. Cubans call their system medicina general integral (MGI, comprehensive general medicine). Its programs focus on preventing people from getting diseases and treating them as rapidly as possible. The MGI integration of neighbourhood doctors’ offices with area clinics and a national hospital system also means the country responds well to emergencies. It has the ability to evacuate entire cities during a hurricane largely because consultorio staff know everyone in their neighbourhood and know who to call for help getting disabled residents out of harm’s way. New York City (roughly the same population as Cuba) had 43,000 cases of AIDS, Cuba had 200 AIDS patients. More recent emergencies such as outbreaks of dengue fever are quickly followed by national mobilisations. Cuba is a leader in eradicating diseases: Pedro Kouri Institute of Topical Medicine, Havana, Cuba, May 2012. Photo by Don Fitz. 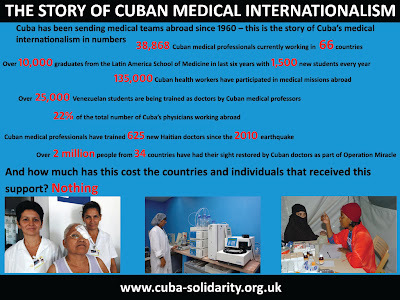 Perhaps the most amazing aspect of Cuban medicine it that, despite its being a poor country itself, Cuba has sent more than 124,000 health-care professionals to provide care to 154 countries. In addition to providing preventive medicine Cuba sends response teams following emergencies (such as earthquakes and hurricanes) and has more than 20,000 students from other countries studying to be doctors at its Latin American School of Medicine in Havana (ELAM, Escuela Latinoamericana de Medicina). In a recent Links International Journal of Socialist Renewal article, I gave in-depth descriptions of ELAM students participating in Cuban medical efforts in Haiti, Ghana and Peru. 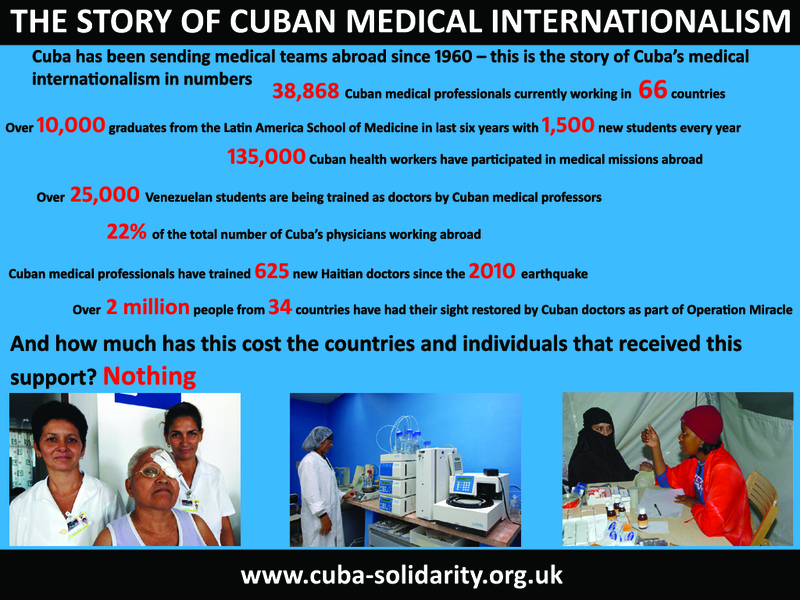 What follows are 10 generalisations from Cuba’s extensive experience in developing medical science and sharing its approach with poor countries throughout the world. The concepts form the basis of the new global medicine and summarise what many authors have observed in dozens of articles and books. First, it is not necessary to focus on expensive technology as the initial approach to medical care. Cuban doctors use machines that are available, but they have an amazing ability to treat disaster victims with field surgery. They are very aware that most lives are saved through preventive medicine such as nutrition and hygiene and that traditional cultures have their own healing wisdom. This is in direct contrast to Western medicine, especially as is dominant in the US, which uses costly diagnostic and treatment techniques as the first approach and is contemptuous of natural and alternative approaches. Second, doctors must be part of the communities where they are working. This could mean living in the same neighbourhood as a Peruvian consultorio. It could mean living in a Venezuelan community that is much more violent than a Cuban one. Or it could mean living in emergency tents adjacent to where victims are housed as Cuban medical brigades did after the 2010 earthquake in Haiti. Or it could mean staying in a village guesthouse in Ghana. Cuba-trained doctors know their patients by knowing their patients’ communities. This differs sharply from US doctors, who receive zero training on how to assess homes of their patients. Third, the MGI model outlines relationships between people that go beyond a set of facts. Instead of memorising mountains of information unlikely to be used in community health, which US students must do to pass medical board exams, Cuban students learn what is necessary to relate to people in consultorios, polyclínicos, field hospitals and remote villages. Far from being nuisance courses, studies in how people are bio-psycho-social beings are critical for the everyday practice of Cuban medicine. Fourth, the MGI model is not static but is evolving and unique for each community. Western medicine searches for the correct pill for a given disease. In its rigid approach, a major reason for research is to discover a new pill after “side effects” of the first pill surface. Since traditional medicine is based on the culture where it has existed for centuries, the MGI model avoids the futility of seeking to impose a Western mindset on other societies. Fifth, it is necessary to adapt medical aid to the political climate of the host country. This means using whatever resources the host government is able and willing to offer and living with restrictions. Those hosting a Cuban medical brigade may be friendly as in Venezuela and Ghana, hostile as is the Brazilian Medical Association, become increasingly hostile as occurred after the 2009 coup in Honduras, or change from hostile to friendly as occurred in Peru with the 2011 election of Ollanta Humala. This is quite different from US medical aid which, like its food aid, is part of an overall effort to dominate the receiving country and push it into adopting a Western model. Seventh, the new global medicine can become reality only if medical staff put healing above personal wealth. In Cuba, being a doctor, nurse or support staff and going on a mission to another country is one of the most fulfilling activities a person can do. The program continues to find an increasing number of volunteers despite the low salaries that Cuban health professionals earn. There is definitely a minority of US doctors who focus their practice in low-income communities that have the greatest need. But there is no US political leadership which makes a concerted effort to get physicians to do anything other than follow the money. Eighth, dedication to the new global medicine is now being transferred to the next generation. When students at Cuban schools learn to be doctors, dentists or nurses their instructors tell them of their own participation in health brigades in Angola, Peru, Haiti, Honduras and dozens of other countries. Venezuela has already developed its own approach of MIC (medicina integral communitaria, comprehensive community medicine), which builds upon, but is distinct from, Cuban MGI. Many ELAM students who work in Ghana as the Yaa Asantewaa Brigade are from the US. They learn approaches of traditional healers so they can compliment Ghanaian techniques with Cuban medical knowledge. Ninth, the Cuban model is remaking medicine across the globe. Though best known for its successes in Latin America, Africa and the Caribbean, Cuba has also provided assistance in Asia and the Pacific islands. Cuba provided relief to the Ukraine after the 1986 Chernobyl meltdown, Sri Lanka following the 2004 tsunami and Pakistan after its 2005 earthquake. Many of the countries hosting Cuban medical brigades are eager for them to help redesign their own health-care systems. Rather than attempting to make expensive Western techniques available to everyone, the Cuban MGI model helps re-conceptualise how healing systems can meet the needs of a country’s poor. Tenth, the new global medicine is a microcosm of how a few thousand revolutionaries can change the world. They do not need vast riches, expensive technology or a massive increase in personal possessions to improve the quality of people’s lives. If dedicated to helping people while learning from those they help, they can prefigure a new world by carefully utilising the resources in front of them. Such revolutionary activity helps show a world facing acute climate change that it can resolve many basic human needs without pouring more CO2 into the atmosphere. Discussions of global health in the West typically bemoan the indisputable fact that poor countries still suffer from chronic and infectious diseases that rich countries have controlled for decades. International health organisations wring their hands over the high infant mortality rates and lack of resources to cope with natural disasters in much of the world. But they ignore the one health system that actually functions in a poor country, providing health care to all of its citizens as well as millions of others around the world. The conspiracy of silence surrounding the resounding success of Cuba’s health system proves the unconcern by those who piously claim to be the most concerned. How should progressives respond to this feigned ignorance of a meaningful solution to global health problems? A rational response must begin with spreading the word of Cuba’s new global medicine through every source of alternative media available. The message needs to be: Good health care is not more expensive — revolutionary medicine is far more cost effective than corporate controlled medicine. This article was written by Don Fitz for the Links International Journal of Socialist Renewal. View the original article with references here. Over 400 delegates attended a packed Conway Hall for the eighth annual Latin America Conference. Whilst progressive governments across the continent lead the challenge to neo-liberal hegemony, the threat of US imperialism remains a real and present danger. In that context, solidarity and support for Latin America is needed now more than ever, writes Bob Oram. It is impossible to put in words the feeling I had listening to Aidee Moreno from Colombia’s agricultural workers union. It is shocking when she describes how her husband was murdered in 1994, her mother ten years later and then numerous other members of her family. On top of this you are numb listening to tales of the 1,000’s of members assassinated, disappeared or in prison. Living with two bodyguards because she is a trade union leader, Aidee is a brave and stoic individual who makes a powerful case for international solidarity. Echoing Frances O’Grady’s earlier comment that it is “wrong for the EU to give its stamp of approval to a free trade agreement with Colombia,” Aidee urged us to lobby MEPs to reject a deal that will not benefit workers. Welcoming the current peace talks brokered by Cuba with the FARC and Colombian government in Havana, she re-iterated that this is a critical moment for her members with violence and threats on the increase. Our support and solidarity is needed more than ever. Frances O’Grady, TUC General Secretary designate, welcomed delegates from Latin America to cold austerity Britain. She praised the huge social and economic advances made across the continent and the “spectacular re-election of Hugo Chavez”. She spoke of her pride speaking at the Vigil for the Miami Five outside the US embassy with Che’s daughter Aleida, and noted that Cuba still defies US might and economic power to put its people first. Jacobo Torres, Executive Committee of the Venezuelan Socialist Party, lamented the western press that call his country a dictatorship. He joked that, having had 14 elections in 13 years, they should have a place in the Guinness Book of Records. With an 81% turnout and 55% of the vote in the presidential elections, Chavez has a legitimacy that our politicians can only fantasise about. “We are building a participatory democracy. While the rest of the world talks about it, we are creating it. It is not the democratisation of poverty as they claim but the real transfer of power to people, so that they can govern and be in control of their own destiny,” Jacobo said to huge applause. Journalist Victoria Brittain spoke about Cuba’s role 40 years ago at the heart of African liberation and drew lessons for Latin America now. Describing the hope encapsulated on Cuba’s Island of Youth, meeting African children who had arrived skinny and traumatised but who grew to be confident and positive, she praised Cuba’s enormous support for African liberation, especially the MPLA in Angola. Reflecting on the strategies employed by the US to topple progressive post-colonial regimes – assassinations, funding ‘oppositions’, smear media stories, economic attacks and corrupting elites – she saw hope today for Latin America in the fact that the ruthless undercurrent of the cold war is no longer prevalent and the internet makes us more aware of what is happening globally. Bob Crow, RMT General Secretary, praised Cuba and all the countries defending their sovereignty and independence in a world dominated by capital. The Bolivarian alternative demonstrates “a world can be built based on need and not greed” he said to cheers from delegates. As always, the only criticism of the day is that you have to make choices. With over 16 seminars and film screenings, something is always missed. This year over 50 speakers covered everything from threats to the Amazon, media misrepresentation, the future of the Malvinas, ALBA, Latin America and austerity, and country-specific reports from Ecuador, Mexico, Cuba, Venezuela, Brazil and Colombia. A packed workshop heard about Cuba and its efforts to update its socialist model. Tony Kapcia, University of Nottingham, contrasted the styles of Fidel and Raul but emphasised their shared ideology. He explained that Cuba should not be viewed through the lens of Eastern European socialism but more as a ‘nation-building’ de-colonisation process that has, for fifty years, involved mass mobilisations of the people. Echoing this theme, Steve Ludlam, Sheffield University, asserted that this is not a change in the system but a change in political culture that is defined by high levels of participation. Public meetings attended by 9 million people ensured less than a third of the original economic proposals survived. Policies such as the changes to exit visas and the sale of houses were proposed by ordinary Cubans as part of a citizen-led consultation. On workplace changes, all attempts to increase productivity by redeploying state jobs to the private sector have to be approved by workplace assemblies with a 75% turnout. All jobs identified have to have clear justification agreed by democratically-elected committees. This ensures no personal reasons or prejudices could be used in selection. Even with these safeguards, the trade unions found problems and the whole process was halted and the issues addressed. Trade unions have ensured new safeguards for all the new workers and are recruiting heavily on the back of this. For example, before the reforms, 2% of private transport operators were unionised. That figure now stands at 80%. Both Kapcia and Ludlam made clear that politics in Cuba is a collectivised process where everyone is represented. Government is accountable – not to outside forces or capital – but society. Carlos Alfaro from the Cuban Embassy thanked the UK government and individual donors that have contributed to the Emergency Appeal for Cuba following Hurricane Sandy. Cuba is facing huge challenges to repair and rebuild the areas devastated by the worst storm to hit that part of the island for 50 years. Sean Crowe, Sinn Fein TD, praised Cuba’s friendship with Ireland and wryly reflected on two small islands oppressed for many years by their nearest neighbour. Highlighting the vote this year at the UN condemning the US blockade, he spoke of the damage it causes to people’s lives. Describing it as “plain wrong,” he decried the immorality of not saving children’s lives when the means to do so are readily available. “The blockade has cost lives simply because of the fear of what Cuba is, its inspiration, symbolism and potential for the rest of the world” he said in a workshop on the blockade alongside the Cuban Ambassador, Esther Armenteros. Esther re-iterated the desire for centuries of the US to see Cuba “fall like a ripe apple into their hands” and the fact they have never forgiven them for building a different society “in their own backyard”. Describing how Obama has weakened his anti-Cuban rhetoric whilst tightening the blockade, she highlighted how it hurts American citizens as well as Cubans. Stressing that Cuba wants to live in peace with its nearest neighbour (“we and they cannot go anywhere”). However, it has to be as full equals and Cubans are prepared to “go on as long as it takes defending our sovereignty and independence”. Rob Miller, Director of the Cuba Solidarity Campaign, urged delegates to ask their MP’s to sign Early Day Motion 497 calling for visitation rights for the wives of the Miami Five. Over 100 MP’s have now signed – but more are needed. Guillaume Long, President of Ecuador’s Higher Education Council, spoke of the many achievements of the government elected in 2006. He explained how Ecuador, by tackling tax evasion, has increased tax revenues from 2.7 billion to 9.3 billion dollars. This has enabled money to be spent on public services. The new constitution enshrines rights for Ecuadorians that are helping repair the sense of nationhood in a state devastated by past instability and economic neo-liberal experiments. The failed 2010 coup signalled the intent of the right but he is hopeful that the forthcoming elections will be peaceful and that the citizen’s revolution of President Correa will continue. Guardian writer Seamus Milne highlighted the democratic nature developments across Latin America. Openings in media, advances for indigenous populations, economic integration and independent foreign policies are all signs of a 21st century socialism in the making. Fearing the capacity for reversals, he warned about his recent experiences observing the Venezuelan elections and the insidious role of the CIA. However his belief in the strength of the people and the “bankruptcy of neo-liberal economics” provides hope for the future. Jeremy Corbyn MP rounded off a great day by calling on George Osborne to learn lessons from Ecuador, Jeremy Hunt to visit Cuba’s health service and for the government to take advice from Bolivia on climate change and Venezuela on elections. Praising the ALBA alternative, he described it as “not just an economic model” but a way of taking the different strengths from countries and sharing. The 69 million people of ALBA and the non-aligned movement are a vital and important counter-force to the unaccountable power of the multi-nationals and we all need to stand firm in solidarity with them. Next year he said, “is the 40th anniversary of Allende’s murder” a stark reminder of the lengths to which the US will be go to extinguish every beacon of hope. In Conway Hall, with a motto on the roof urging, “To thine own self be true” it was a fitting end to a great day, as he urged vigilance and increased solidarity with all the countries in Latin America. Delegates left to a bucket collection for the emergency appeal for Hurricane Sandy which struck Cuba in November. The collection raised a magnificent £774.90 which will be sent to Cuba immediately. If you would like to donate, please send your donation to the Cuba Solidarity Campaign, c/o Unite Woodberry, 218 Green Lanes, London, N4 2HB. Cheques or postal orders should be made payable to ‘CSC’, and clearly marked on the back ‘Hurricane relief’. Further information on the hurricane relief effort here. A selection of photos from Latin America 2012 can be seen here.